alan hitt: Left Behind. No Rapture Required. I saw this church sign today and thought about what was behind the decision to put it up. What if a Ford dealership put up a sign that said "Cars Like They Used to Be?" You know, no air conditioning, a manual choke and wood-spoke wheels with tubed tires. Or what if a theater had a sign that said, "Movies Like They Used to Be?" No sound. Black and white only. Special effects comprised of things attached to visible string and miniature towns crushed by humans in badly constructed monster suits. Frequent stoppage of the movie to splice back together the broken film. 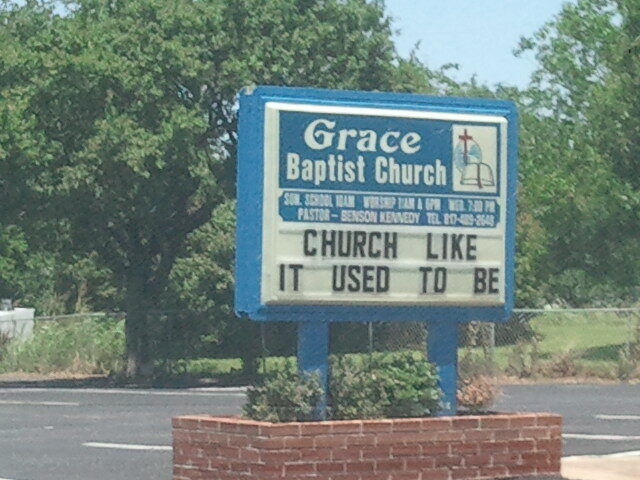 Still, part of me gets why they long for church like it used to be. The trouble is, God is always doing a new thing. While Jesus is the same "yesterday, today and forever" (Hebrews 13:8), God's way of extending love and compassion is "new every morning" (Lamentation 3:22-23). So Jesus like he used to be is fine. Church like it used to be may find that God is up to new things. Turns out we might not even need a Rapture to be left behind.